Drivers caught speeding will soon face stricter penalties and much higher fines, based on what they earn. From April 24, 2017, new rules will come into place in the UK, this will mean offenders could now be charged up to 175% of their weekly income. In the UK, the current mini penalty for speeding is a £100 fine and three penalty points on your licence. The maximum fine is £1,000 or £2,500 for motorway offences. New guidelines set to come in next month will see those caught driving over 101mph in a 70mph speed limit potentially disqualified for up to 56 days, with a fine of between 125 to 175 per cent of their weekly income. If you’re caught going between 31 and 40mph in a 30mph zone will will get three penalty points and a fine between 25 to 75 per cent of your weekly income. Many drivers can get away without points and a fine by paying to attend a speed awareness course. New legislation follows as tougher penalties that have been brought into place for motorists caught using a mobile phone behind the wheel. The penalties have now doubled for those caught, from three points and a £100 fine to six points and a £200 fine. How much will I be fined if I’m caught speeding? 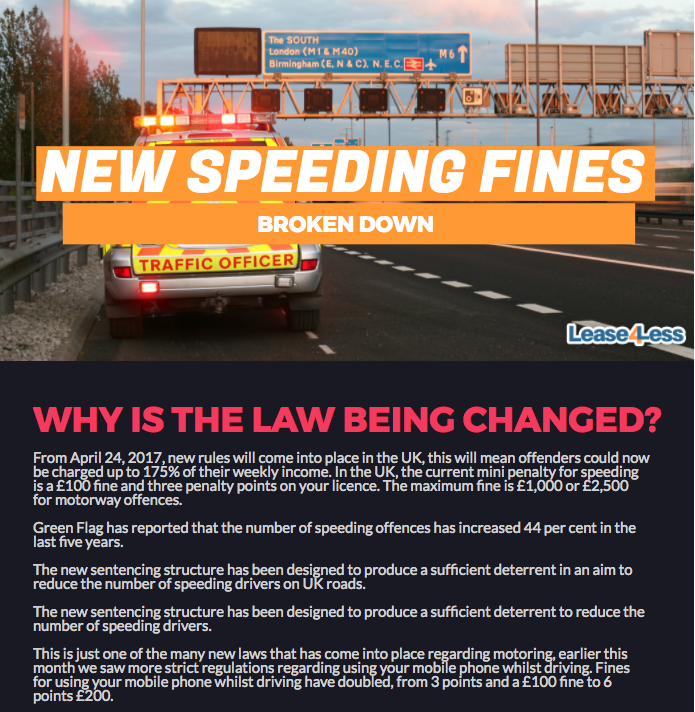 The new speeding system has been split into three bands, the bands will rate the severity of the offence based on the speed limit. Band A will relate to an offence that is between 1 and 10mph over the speed limit. Offences in the B band are for drivers who are caught from 11 to 21mph over the legal speed limit, a band C offence is above 21mph and above the stated speed limit. Band A fine is 50% of your weekly wage. There will be four key changes to the driving test that will come into force from December. The London Taxi Company open £300M plant that will produce new electrified black cab. There are changes for motorists regarding company car tax, diesel vehicles, corporation tax and more. Car leasing experts Lease4Less break things down into a simple guide. A T-charge will work alongside the existing congestion charge, affecting older petrol and diesel cars. From March 1, the booster seat ban will stop younger children using backless booster seats. On 1 April the Vehicle Excise Duty known as road tax will undergo major changes. Currently 200 miles of motorway have been converted to smart motorways in England and Wales. Government plans could see learner drivers allowed on the motorway to help make roads safer. Lease4Less shed some light on what vehicle leasing is and whether it's for you. One of the biggest insurance companies plans to use social media to analyse car owners. The study reveals women are, on average, 12% angrier than men when behind the wheel. I had a very positive experience with Lease4Less. My Key Account Manager Laura dealt with my case in a very efficient and courteous manner. Outstanding standards of service and professionalism; highly recommended. I would recommend Lease4Less and the consultant James Rushton, he kept me up to speed with information and when the car was likely to arrive, fantastic.